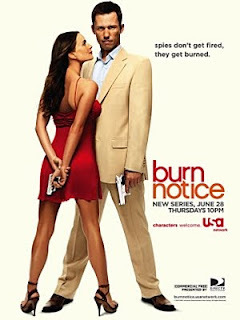 Tonight is the return of one of my favorite shows: Burn Notice. It's a story of a spy who got fired and now works as a private investigator in Miami. Lots of guns in the sun. Unlike another show with "Miami" in the title that is filmed in Long Beach, CA, this show is actually shot in Miami. It's a great show with great stories and great characters. I love it. There sure are a lot of spy show on right now. Chuck started up again last week. The new "Chuck 2.0" is really working for me. Now he not only has super brain with all the super criminals in the world programmed, but he can access other super abilities like Kung Fu or speaking Cambodian, etc. Go Chuck! However, the funniest spy show ever just started on FX. You really need to watch this. This show is filthy, and since its animated they seem to be able to get away with some of the nastiest dialog I've heard on TV. Sterling Archer is the main spy of the spy organization called ISIS. The main joke is this show is really just an office comedy, but the company is a spy company. 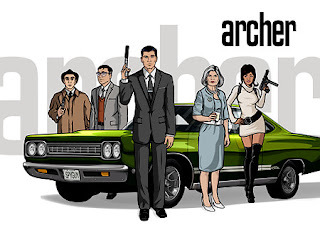 Jessica Walter who played Lucile on Arrested Development is the voice of Archer's mom/boss. Somehow with just her voice she manages to steal every scene like in AD. This show is also on tonight. Don't miss it. Season two of Life After People starts tonight on The History Channel. This great docu-series hypothesizes on the fate of human creations if all people in the world disappeared at once. Last year the series followed a pattern of aging a couple cities with CGI and interviews with scientists and other experts. They also find places around the world that have been abandoned and show what nature has done over the years. They often explain the fates of dogs and other domesticated animals. The first episode of this season is focusing on churches and next week is about toxic waste. Plus all day they are running episodes from last season. Don't miss it. Tonight the newest season of The Bachelor begins on ABC. They take themselves way too seriously. The hunky pilot is shown sans shirt all over ABC promos. The women are still skanky hos. EW quotes one of them saying, "You can land your plane on my landing strip anytime." Whore. Instead of watching this trash which pretends to be culture, flip over to VH1 and watch their new trashy dating show which doesn't pretend to be anything thing it isn't, Frank the Entertainer in a Basement Affair. Frank is just as hunky as the Bachelor pilot but he is also hilarious. This show is a spin-off of I Love New York which was a spin-off of Flavor or Love which was a spin-off of Strange Love which was a spin-off of The Surreal Life. Frank failed to win Tiffany "New York" Pollard's love, mostly because he was over 30 and still lived in his parent's basement. There are two reasons this is my favorite dating show in a while. First they are not in a mansion in the Hollywood Hills or a resort in Hawaii. Instead all 15 women are staying in Frank's parents house. They ladies are crammed into three guest rooms: the blue "boys" room, the pink "girls" room, and "grandma's" room. The girls and boys rooms are decorated like a model home, while grandma's room is lacy and very Jesusy. The second reason I love this show is the real star: Frank's mom. She's a ball-busting New York Italian mother who is very loud and opinionated. She is around all the time and sits by during elimination, when Frank gives out keys to his basement to those who stay around for another episode. This is was Mama's Boy should have been, but it kinda sucked. I love Frank's mom. So if you think about watching The Bachelor, check this out instead.